So good news I figured it out, in a fit of rage I threw the hammer away and just slapped the lifter with the board itself and it popped right apart. I only have 5 that weren't holding pressure and getting stiff when I pumped them up so I will take those apart and clean them and then should be able to put the cams in. Last edited by brokeneck; 10-28-2017 at 08:21 PM. Smacky lifter against wood next time broh. So I am now trying to get the engine all squared away, outside the car. I have some new lifters on the way, so once those get here putting the s52 cams in should be easy. Right now I am mostly having trouble figuring out the wastegate flange. I ordered a flange and it wasn't the right size for the manifold, and the wastegate comes with the flanges it needs for the v band inlet and outlet. Do I need to get a universal flange that fits the manifold and then weld on the v band that they gave me with the wastegate? Is it a spa manifold? It uses a smaller flange, best bet is to order one from technica, or from a spa dealer. I would not fab the wastegate pipe outside the car. It is a very tight fit against the frame rail. You need to design a pipe that places the wastegate down next to the transmission. You will never fit the wastegate directly off the manifold. Last edited by vr6dubny; 11-07-2017 at 10:48 AM. So I wanted to get some advice for the last few parts I need to order. What I need is the oil flange from the turbo, bung, and hose for the oil return, and coolant lines to and from the turbo. I was wondering if I need to get AN fittings and AN line or if i can just get barbed fittings and hose clamp them like I have seen in some pictures. I have read that I need to use 10 AN hosing so that the turbo can drain fast enough, but am I able to buy AN hosing and just hose clamp it? Also for the coolant lines, what size should they be and do I need AN line? i knew i had it somewhere, there it is. I now have the engine with the turbo in the car and everything all bolted back up, plugged back in, and vaccum lines sorted. Now its just dropping the injectors in and putting the m50 manifold back on, exhaust fabbing, and intercooler plumbing. First off, is there anything specific I need to do to successfully delete the secondary air pump? Also, now that I will soon be starting tuning it with romraider, what do you guys think is my best starting course of action. I read the partial stock tune off the ecu before I took it apart and now it will have an m50 manifold, s52 cams, 60# injectors, and a Nissan slot MAF. I am going to put in the smallest wastegate spring I have initially which I think is 5 psi. Should I try initially with stock injectors and MAF to at least try and get it tuned a little better for the m50 and s52 cams. Or should I just try hooking everything up and trying to start it and slowly working my way from there. This would be on 91 octane, but I do have an e85 station 12 miles from me if you guys think there is no hope on 91. Last edited by brokeneck; 12-30-2017 at 12:41 PM. So I now have the car up and running, I'll be posting pictures soon here, but it started first try and didn't blow up contrary to my expectations. I drove it around the block today on the tuning I did for the bigger injectors and it seems decent enough at around 11-13 afr moving around slow while warm but it started to get kinda high once I started getting into boost, but man does the boost feel good. I found the power feed to the radio that was switched. There are usually 2 going to the radio, one unswitched (usually yellow?) and one switched (red?). I might have that backwards though. Ill have to check it out, is there anyway to check and make sure which is switched other than cutting it and testing it with a multimeter? A piece of wire, a 12v lightbulb and unplugging the radio will do it. Or spending some time googling the wire colors for the E36 radio wiring. Red with grey stripe is switched radio power. I wired my oil pressure and water temp gauge illumination to that wire. Very fancy. Interesting choice in turbo. Not something I'd go with on a 2.8li motor, but should make for a fun setup. A gt3076 is perfect for a 2.8 for auto-x, or a fun street car IMO. Quick spool with easy 400-450whp capability. Who cares if it dies a bit after 6k, when you spool it before 3k? He already had the turbo, so no sense spending on another one. Sure if he was buying a new one, there are better options with newer turbine tech, but that's not the case here. 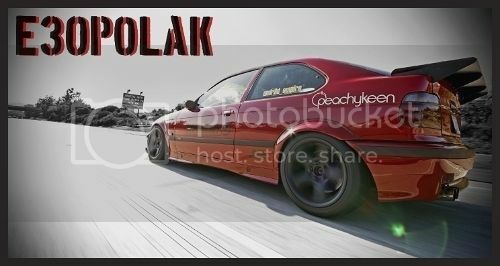 Last edited by e30polak; 01-25-2018 at 12:45 PM. I did say it was going to make for a fun setup. He should also consider RK tunes for tuning. I've had his tunes on several of my cars. So I know I said this a long time ago and these arent too good of pictures, but this is what I've got. Also my car is kinda function over form at the moment. Somehow I've managed to not blow my car up and tune it decently with Romraider through the help of the people on the Romraider site and special shout out to tptrsn for all his help and advice in getting me through the tuning process on this car, really wouldn't have happened without him. Currently running 7 psi on 91 octane and the boost comes in nice and early. Thanks to everybody for helping and answering questions along the way im sure ill have plenty more, just a nice little milestone. Last edited by brokeneck; 03-30-2018 at 01:01 AM. Yeah im currently running into quite a bit of limitation on 91, Im not able to have enough ignition timing without knock. With some octane booster it was decent so maybe if there was 93 around me, but there are more e85 stations near me then there are 93. Im gunna tweak my tune and go fill er up. Have you tried adding 1-2 gallons of e85 to a tank of 91 yet? It will make a huge difference. Your AFRs may have to be richened up a bit so do some testing.